Very sad news late last week, when I heard of the death of William Goldman. 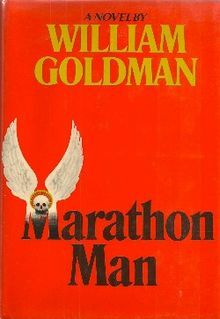 I’ve been a fan of William Goldman since the age of 15, when I first read MARATHON MAN, at which point everything changed. I didn’t realise it at the time, but if there is such a thing as the Top Five Thriller Twists, at least two, and maybe three, are to be found in MARATHON MAN. Goldman, of course, was a novelist and screenwriter, winning two Oscars. His finest work included the scripts for Butch Cassidy and the Sundance Kid and All the President’s Men, as well as the novel (and screenplay) THE PRINCESS BRIDE. I watched The Princess Bride last Friday night, and read MARATHON MAN over the weekend, and both are as fresh as the day they were released (“My name is Inigo Montoya. You killed my father. Prepare to die.”). Orestes: You must go before me. Aegisthus: That I may not escape you? Orestes: That you may not be killed where you would choose. You shall taste all the bitterness of death. If retribution were swift and certain, and the lawless man paid with his life, there would be fewer villains. So there you have it – justice as swift and savage retribution, and only a couple millennia or so between them. If you’re an aspiring thriller writer, and you haven’t read MARATHON MAN, I’d suggest buying it immediately and then leaving it to one side until you’ve finished your first draft, lest you discover yourself, as I did, sorely tempted to steal all its best bits.